Donegal produced a strong final quarter to beat Mayo 1-14 to 1-12 in Division 1 of the Football League but Down were trounced 0-22 to 0-6 by Kerry. Mayo led 0-8 to 0-7 at half-time at Ballybofey and moved three ahead after Diarmuid O'Connor's penalty. However, Leo McLoone's 58th-minute goal helped Donegal keep their 100% record as they won an entertaining contest. Down remain rooted to bottom of Division 1 after another chastening home defeat. The Mourne County were hammered by Donegal at Newry in their league opener and after blowing a chance to beat Monaghan in the second game at Clones, Down produced another woeful Pairc Esler display. Down failed to score for 30 minutes either side of half time in an embarrassingly one-sided contest. Bryan Sheehan top-scored with 0-6 for Kerry who picked up their first win of the campaign as Kieran Donaghy and Colm Cooper made their first appearances of 2016. In front of over 11,000 spectators at a sunny MacCumhaill Park, Mayo led 0-2 to 0-0 and 0-4 to 0-2 but Donegal stayed in touch as fine scores from play from Ryan McHugh and Rory Kavanagh and a Michael Murphy 45 cut the Connacht champions' advantage to 0-8 to 0-7 at the interval. Excellent scores from McHugh, Paddy McBrearty and Donnacha MacNiallais moved Donegal 0-10 to 0-9 ahead but Mayo were back in front after O'Connor blasted in his controversial penalty. Donegal's defence insisted that Evan Regan had carried the ball out over the end line in the run-up to the spot-kick award and O'Connor had to net the penalty twice after referee Barry Cassidy spotted an infringement with the initial kick. Shortly after the penalty, Donegal endured another blow as substitute Neil Gallagher was black carded for a hand trip less than a minute after coming on. But from 1-10 to 0-10 behind, Donegal outscored Mayo 1-4 to 0-2 in the closing 15 minutes. McLoone's 58th-minute goal came after Donal Vaughan spilled a Robert Hennelly kick-out in midfield with Toye and Kavanagh combined to set up the over-lapping goal-scorer. Murphy's towering 62nd-minute point to increased Donegal's lead to two points was an inspirational score as Mayo'a old Achilles heel of missing chances afflicted the Connacht champions in the closing stages. 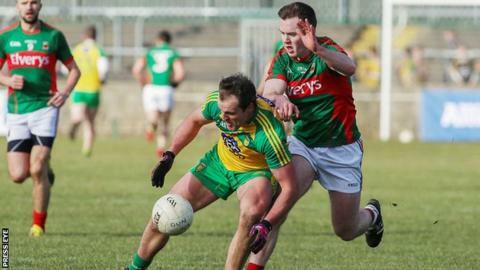 The only downside from Donegal's win was a suspected hand injury sustained by corner-forward Martin O'Reilly in the closing stages as Mayo remain without a point after three games. At Pairc Esler, Darran O'Sullivan's pace caused serious problems in the Down defence and he scored the first of four points from play after just 30 seconds. Kerry scored the opening three points before Down got on the board through Connaire Harrison's 14th-minute free. Eamonn Burns' side scored three points inside four minutes to draw level, Barry O'Hagan with their only point from play in the first half. But they failed to score again in the first period, Kerry hitting an unanswered six points to lead 0-9 to 0-3 at the interval, Sheehan and Alan Fitzgerald among the scorers. Conor Maginn stroked over a 45th-minute point for Down, their first in half an hour, but immediately Kerry brought on Colm 'Gooch' Cooper who scored a free within a minute of his introduction. Kerry manager Eamonn Fitzmaurice emptied his bench with Barry John Keane, Brendan O'Sullivan and Cooper all contributing on the scoreboard. O'Hagan scored his second point of the afternoon with sub Ryan Mallon also weaving through for a nice score for Down, who gave up the fight alarmingly early, allowing Kerry to stroll to a comfortable victory. The struggling Mourne County look unlikely to be boosted the addition of Martin Clarke and Benny Coulter any time soon. Clarke's brother John told BBC Radio Ulster's Sportsound on Sunday that the former AFL had told him over the weekend that his struggles with the Addison's Disease mean that he will be unable to commit to the county squad in the immediate future. Down boss Eamonn Burns said in January that he hoped to have Benny Coulter back in the squad soon but this now appears unlikely.